In the last 2 years I've become a bonafide amateur hiker. I credit this 100% to meeting and marrying M because otherwise I'd probably just do it when forced to. 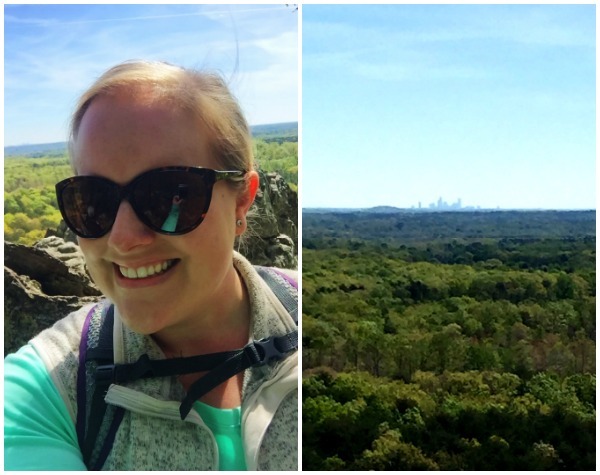 M and I decided to try hiking Crowders Mountain, about an hour away from where we live. This would be my first actual mountain hike since I've only done flat or hilly trails in the past. It was also a good opportunity to break in my new hiking shoes I bought for our trip. This sign greeted us twice on the trip in two separate areas. Obviously these signs REALLY helped psych us up to hike. :) Also, you literally scale the back of the mountain here. Like climbing up and over rocks...the trail is marked but it's not really a trail. 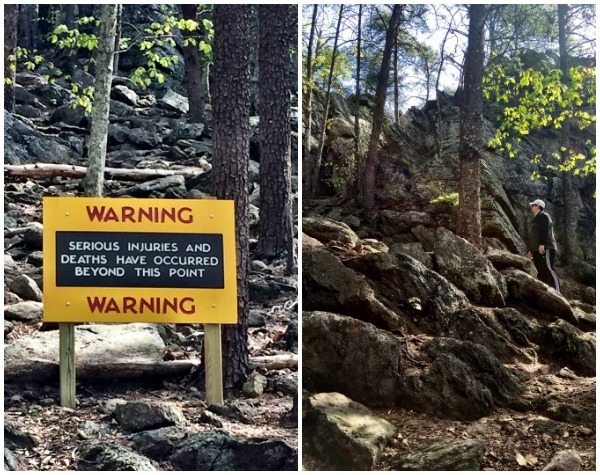 Where you see M in the right picture was part of the trail we hiked up. Crazy! The views from some of the cliffs were amazing. The weather was absolutely perfect. A little cool and definitely not hot so perfect for hiking. At one cliff, you could even see uptown Charlotte which is over 30 miles away! We could have just sat on the rocks and gazed for hours, but unfortunately everyone and their mother decided to go hiking so we only spent a little time at each cliff. We had a great time hiking and definitely want to go back and do The Pinnacle and a few of the others trails as well. It was a pleasant surprise to see that according to my Fitbit we climbed 70 floors and had 84 minutes of hiking. Maybe after a few more times we'll be considered legitimate hikers? Stay tuned for more hiking updates as we train. We definitely should have gone on more hikes before we went out west. I'm glad you guys are doing this! It will make your trip so much more enjoyable. Rockytop is my favorite! 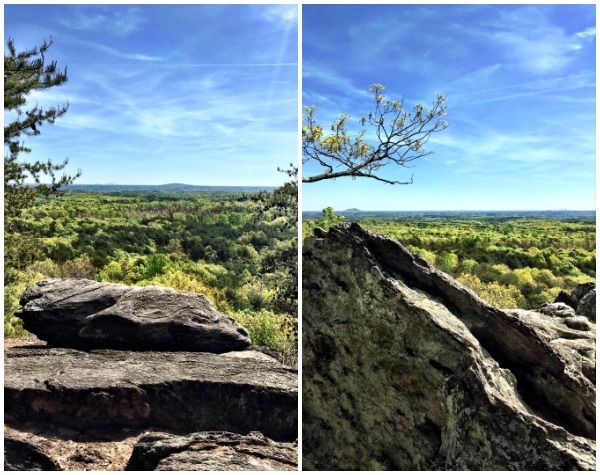 You should try the one that goes to Kings Mountain to get a different view. Starts from the same Ranger station. I can't remember what it's called, but it might be Pinnacle.